Recently some great mind uploaded this picture on FaceBook and it has been shared by thousands of people. At first I just saw that as a picture. The picture conveys the message that Rowan Atkinson has made a big sacrifice by becoming a comedian where as he could have become a world famous Electrical Engineer. Has Rowan Atkinson lost anything by becoming a Comedian? Is the comedy business a cheap business? Why do people have to write " He STILL chose to be a comedian" as if the Comedy circuit was something similar to begging. We must know that because he chose to be an entertainer through the stream of humor, he has created a brand for himself. Many do not even know his real name. 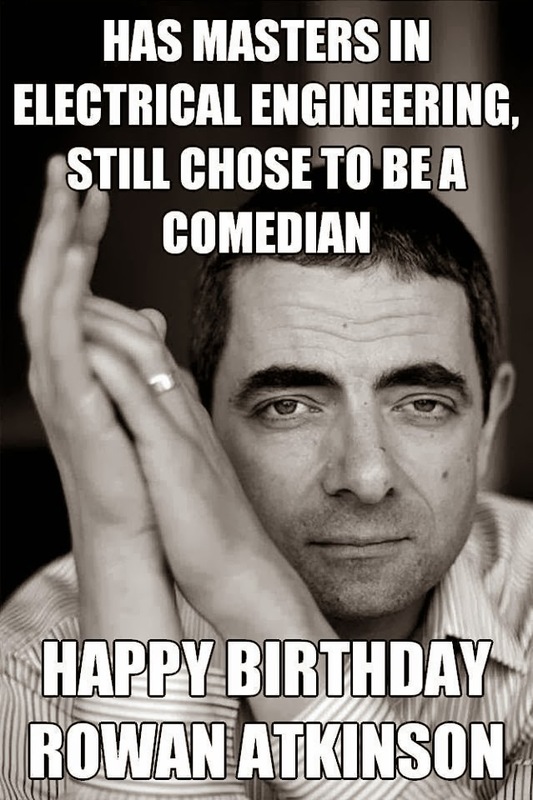 The world knows him by his screen name Mr. Bean. That is the power of the brand he has created and he has excelled in it. If the poster is meaningful by even 1 percentage, then we have to start looking at all the Engineering degree holders in India. You can see an engineer in every nook and corner of India. What do they do? I know Engineers who are auto drivers. I know Engineers who are cab drivers. I know Engineers who sell grocery in Koyambedu Market in Chennai. They have done a greater sacrifice than Mr. Rowan Atkinson. Every one of us have sacrificed something or the other. I am a big fan of Sir. Rowan Atkinson. He makes us all laugh. He has not done any sacrifice. He has just followed his passion. If following his passion is called as sacrifice, then we should recycle our thinking process. I am an Engineer too ( An Instrumentation Engineer). Please do not ask me any thing about Instrumentation Engineering. Even if you ask me any doubts in it, I would not be able to answer it for you because I really do not know the answer. (Enakku Theriyaadhu. Bit adichu pass pannavan kitta keakkura kelviyaa idhu). Follow your passion and Live your dream. Why is that your blog, tab pages are defunct..is it hacked? I believe it is also the lack of guidance during the formative years of a person, that makes him to get settled with whatever is thrown at him. Most of us who studied engineering, did it to satisfy the longings of our parents and well wishers rather than passionately choosing to do it. The result is getting locked into any job that comes by, and feeling bad about it for the entire life. There is very little that one can do about it during the later stages of the life though.